Narrow lot house designs are on everyone’s mind these days. Some people need to work with a narrow design because of land costs; but lots of people also love the design because it fits with today’s concerns for minimalism and sustainability. Influential designs come from all over the world, and we’ve picked a few that are particularly inspirational. Narrow lot homes have always been a “thing” in Japan, and some of the most amazing examples of space-saving design that can be incorporated into new luxury homes come from this small island nation. The WBE home was planned and built by a AUAU Studios in Nagoya. It features a light, airy design that perfectly marries Asian minimalism with contemporary luxury, and it’s all in a tiny package. Another design studio, Mizuishi Architect Atelier, has come up with one of the most unusual home designs anywhere in the world. This two-story, super-narrow structure works for a family of three and features clever storage solutions with long, window-lined rooms that appear spacious and a clean feel that discourages clutter. Our final offering from Japan is named Lucky Drops and was designed by Atelier Tekuto. The designers had to contend with a great number of code restrictions to make this narrow home happen. The structure features a post-modern design, clean white lines, and lighting designed to maximize indoor and outdoor aesthetics. Narrow home designs have always flourished in Scandinavia. Smaller homes are more heat-efficient, and in areas where there are fewer trees, it pays to be conservative with wood use. Scandinavian homes are also typically designed to maximize natural light. Located in Sweden, this home was designed by Claesson Koivisto Rune and was designed to appear far less than it really is. Unlike other houses on our list, this one is made of prefab concrete and is really nothing more than a simple box shape. But what they’ve managed to do in that box is impressive. Another offering from Sweden, this design by architects at Elding Oscarson is just 5 meters wide and sits among some of Sweden’s oldest homes. The tiny plot of land on which it was built stood empty for years until Oscarson decided to take on the challenge. The inside is one space separated into three floors, each with its own clean, functional design. GWSK Arkitekter wanted to create a narrow home based on a barn design. They succeeded in this narrow but long holiday home in Bläsinge, Sweden. With sliding doors that close all around to protect the windows, a deck for outdoor dining in the summer, and vaulted ceilings to give a greater sense of space, this is truly an unusual narrow home design. Scandinavia and Japan aren’t the only place with designs to choose from. Here are two more designs that are just so fantastic and historic that they have to be on any list of narrow homes. 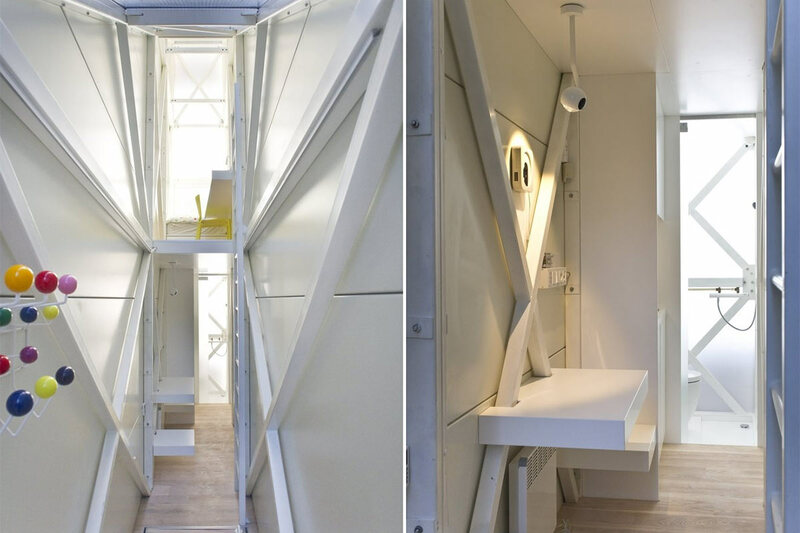 This home in Warsaw is only 152 cm wide at its widest point. Designed by architect Jakub Szczęsny and built in 2012, it sits in the old Jewish ghetto and is an homage to the hiding places that Jews of the area used during World War II, though without any sense of constriction. Sandwiched between brick apartments on Hull Street in Boston, Massachusetts, this tall, narrow home has four floors but is only 9 to 10 feet wide. What’s interesting about this house is how long it has been here. No one knows for certain, but at least one popular legend says it was built by a Tory who wanted to obstruct the view from his patriot neighbor’s home during the American Revolution.